At RiteScreen, we’re 100% dedicated to the screen business, producing more than 200,000 window screens and 32,000 door screens each week. Our continuous commitment to quality and service is the foundation of our business. We get it – because we’ve been industry leaders for over 70 years. The RiteScreen Team comes to your facility to perform a comprehensive review of your products, manufacturing processes, and a needs analysis. We offer recommendations on how you can achieve the greatest cost savings. Our R&D department goes to work, continuing to collaborate with your team each step of the way to ensure the design provides the best possible value and that your screens will be the perfect fit for the specific products that you produce. RiteScreen continues consulting with you on your new processes and products. When you decide to outsource, our team of expert fabricators will get to work producing screens using the designs we developed with your team. RiteScreen offers custom-engineered packaging options. Your screens will be delivered from one of our seven strategically located manufacturing facilities to ensure on-time delivery. We’re confident that you’ll value our consultative services as a way to find your best screen solutions. As you identify a need, RiteScreen becomes involved early in the process to ensure no opportunity for product improvement is wasted. We’re committed to continued improvement of all aspects of our business, utilizing weekly kaizen tools and 6 sigma metrics to develop and sustain improvement. Implementing these initiatives has changed our culture and we welcome our customers’ participation in our kaizen events. RiteScreen offers custom-engineered packaging options, house packs labeled specifically for your customer or sequence delivery of screens “ready for the line.” Your screens will be delivered from one of our 7 strategically-located manufacturing facilities to ensure on-time delivery. 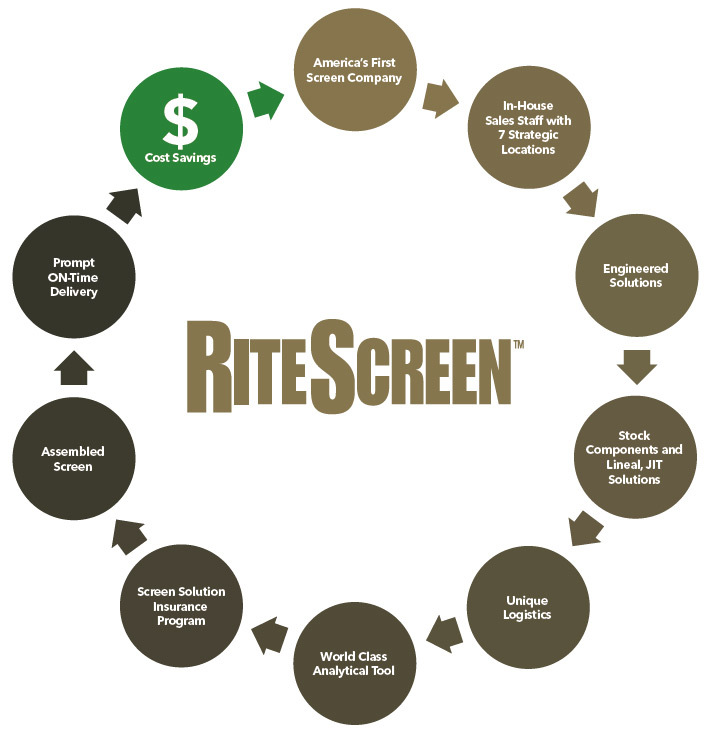 RiteScreen’s Frontier enterprise resource planning system allows for fast, accurate electronic ordering, seamless flow into manufacturing, and rapid delivery of product.